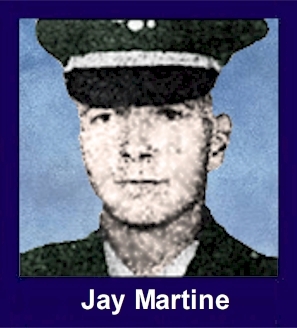 The 35th Infantry Regiment Association salutes our fallen brother, 2LT Jay Barklow Martine Jr., who died in the service of his country on July 18th, 1967 in Quang Ngai Province, Vietnam. The cause of death was listed as Small Arms/AW. At the time of his death Jay was 23 years of age. He was from Buchanan, Michigan. Jay is honored on the Vietnam Veterans Memorial at Panel 23E, Line 87. The decorations earned by 2LT Jay Barklow Martine Jr. include: the Combat Infantryman Badge, the Bronze Star with V, the Purple Heart, the National Defense Service Medal, the Vietnam Service Medal, the Vietnam Campaign Medal and the Vietnam Cross of Gallantry with Palm Unit Citation. Funeral services for 2nd Lt. Jay Barklow Martine, 23, will be held Friday morning at St. Anthony Roman Catholic Church. The Rev. Leon Pohl will officiate with internment at Oak Ridge cemetery. Lieutenant Martine, the first Buchanan area resident to die in Vietnam, will receive full military honors at graveside. The honor guard will consist of regular Army officers, of at least equal rank, from Fort Benjamin Harrison, Indianapolis, Ind. The son of Jay B and Marguerite Kuntz Martine of 3110 Spirea Road, Lt. Martine died July 18 at 2:25 pm during a combat operation. The 1962 graduate of Galien high school entered the Army January 4 1966, and completed Basic Training at Ft. Knox, Ky. He graduated from OCS in the top one-half of his class and received his commission as Second Lieutenant December 5 1966. Lt. Martine was born August 24 1943 in Niles, Mich. And had lived in the Buchanan area since 1956. Surviving are two sisters and one brother. Friends may call at Swem Funeral Home. (From The Virtual Wall) At an age and during a time when half an hour seemed like an eternity, Jay and I were together at Bragg for but a few months, but I soon came to regard him as a friend for life. Bright, compassionate, enthusiastic, yet markedly reserved, Jay had about him the aura of one who could accomplish any noble purpose to which he set his mind. He helped me acclimate to being Stateside after two years abroad, rescued me from several roadside breakdowns, and generously shared his time and talents in a host of projects. In return, my wife and I welcomed him into our little family circle and did our best to help relieve for him the tedium of BOQ living and officers' club food. My dog, an astute judge of character, followed Jay around like ... well, like a faithful dog. Whenever there was a car to fix, a TV antenna to install, a sad tale to tell, or some surplus beer to dispose of, Jay was the man for the job. Then, as was common back then, Jay got his orders for RVN and in the blinking of an eye, his name was being listed among the casualties published in the Army Times. I was angry then and I am angry now. Angry that I could no longer look forward to our time together,only back. Angry that one so young was ripped from this life before experiencing all the rewards he so richly deserved. Now, I am merely angry that so many fine young Americans of all races and ages and creeds were sent to fight in a war that a cynical leadership never intended to try to win. But there is a ray of hope in all of this. When I check into Fiddler's Green, and time is marching on for all of us, I expect to find him waiting to show me the best place to pitch my tent and the best slot at the bar. Too soon you died, my friend, but never mind. We'll talk it all over when next we meet.